I'm cheating a little in saying I was just at a philosophy bar. Yes, we discussed philosophical topics. Anna's boys (men) are really into those. Belief in a god, in a self, were topics of conversation (I prefer directing skepticism towards a "belief in self" than a "belief in God" as that tends to hit closer to home, sparks deeper debates sometimes -- plus who cares about "beliefs" anyway sometimes (Karen Armstrong an influence)). However, the giant LCDs were all devoted to sports events. We actually needed to request a more out of the way table so that our philosophy talk might be more focused. Just before heading down to this "philosophy bar" (on the 2nd floor of this hotel), I'd been adding to some thread on precisely this topic. In part I was keying off some stuff Nirel had been saying regarding the Netherlands. They're feeling burdened in Holland, yet realize their bars have become a tourist destination, owing to less prohibition in that neck of the woods. Are the trade offs worth it though? Lots of debates. Another way we intersected philosophy today was at the University of Washington, where we toured the campus. Savery Hall is where the philosophy department is headquartered. Then we went to the bookstore, where Tara browsed in neuroscience. I mostly perused angry political books by people taking issue the what they imagine to be the president's programs. These angry taxpayers would probably never support Operation Starry Night, my utopian science fiction about helping students escape light pollution, a way of investing in the future. I was meeting with Anna Roys in this philosophy bar (really just a sports bar) in downtown Seattle. We're both into education reform in our respective ways. She's become a certified teacher since I met her the last time, when she came through Portland. Her Thunderbird Academy is still in the works, although it may piggy back on an existing public charter, rather than launch a new charter of its own. Anna is here to visit with two of her four adult sons. I went over my thoughts about philanthropic gaming again, and my history as a buckaneer, starting with Walter Kaufmann's endorsement of est as an interesting exercise in applied philosophy. I become more aware of Bucky Fuller through Erhard's collaborations therewith. These collaborations maybe didn't sit well with E.J. Applewhite, at least at first. Bucky was already facing PR problems without this. That's all water under the bridge by this time though. We also talked about the bizmo idea. The Pacific Science Center is running one that brings a "dog and pony show" to Washington State schools. Anna had even thought of applying for the position at one point. A recent thread on the Math Forum regarding multiple choice testing got me thinking about OMR again, and the energy simulation games that might use it. SimCity could add this module with practically no changes to the underlying framework I bet. Perhaps I should write to Maxis. Or should we start over from scratch, using open source Python, perhaps Blender? OMR, for those who don't know, is a stadium-shaped city projected for middle America back in the time of the Union Tank Car dome, the apogee of that kind of technology in North America, at least until EPCOT. Actually that Baton Rouge dome opened for business in 1958, the year I was born, so I guess I'm a little off on my time line. 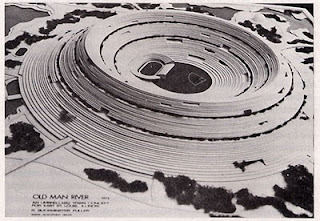 The plan for Old Man River City came out of the civil rights movement and was part of the "war on poverty", envisioned as a public work fueled by a "peace dividend" (although that wasn't the term used). The prime contractor irrigation system, set up during WW2, proved too lucrative to just turn off, and indeed was ramped up under Eisenhower under the direction of Congress, which saw pork barreling of defense spending (so-called "ear marks") as the ticket to staying in power. ICBMs became cruise missiles which then morphed into drones. Each generation of technology required its "theater" for live guinea pig testing, usually overseas, although paramilitary goods had their domestic applications as well, among police forces, private security services, hunters, and survivalists. After-market military equipment remains an important ingredient in most scouting programs. Many homeless people use military grade sleeping bags. President Eisenhower could see the writing on the wall and realized that war, once hugely profitable, could be commodified and sold to the American people as a permanent way of life. Robert McNamara, fresh from a job with Ford Motor Company, helped "create the space" for all subsequent secretaries of defense. If allowed to build aircraft carriers, tanks and missiles (along with a defense against missiles) white collar voters would prove grateful and loyal, regardless of any party affiliation. These were the family wage jobs one needed to pursue the American dream of happiness, preferably in a suburban setting. Not all Americans would sucker for this plan, but enough of them would to keep LAWCAP in ascendancy through the arc of the Cold War, and on into its War on Terror. The architects of this economy took Europe's religious feuds as their gold standard, a time-tested recipe for prolonging hostilities. As long as Jews and Muslims couldn't see eye-to-eye, the money changers would have a field day in the temple, while Christians could be counted on to arm all sides. The term "beltway bandit" was common currency in the news stories and referred to that privileged cast frequenting the "revolving door" twixt the arms bazaar and DC-based agencies. "Privatization" (a euphemism for cannibalizing public resources) transferred much of this know-how overseas, helping "level the playing field" as billionaires spread around the globe more evenly. The hoi polloi made do with their impoverished schools, decaying infrastructure, and nursed their hatreds for the designated scapegoats du jour. They were told that any living standard advantages they enjoyed were a consequence of weapons research, and for many decades this folk myth was accepted. As America fell further and further behind in the standings, some deeper thinkers came to question this central dogma, including many CEOs of well-known companies, who saw the mindless waste more in terms of its opportunity costs. OMR, a symbol for any number of futuristic projects, large and small, stayed in the closet, amidst other esoterica. Not even the science fiction writers out of Hollywood dared touch it, lest old civil rights memes get reactivated. Positive futurism had the potential to "go viral" and the advice from PR firms was to "keep a lid on it" if serious about getting sponsors and advertisers. Nick reconnected me with the architect John Discroll, this evening. He'd been in Oklahoma recently, at another convergence celebrating the work of architect Bruce Goff. His own chief mentor had been in that lineage. We shared a meal prepared by Hannah. The house they're staying at is connected to the Santos Daime church in this town. I took some pictures of the interesting decor. Carol (my mother) is leaving tomorrow, to stay the winter in Whittier, her other home with my sister. We sent the shipment of eleven boxes by UPS today, files and clothes. Tara won best in show (best overall speaker) as well as first prize for Lincoln Douglas debate at her meetup today -- four awards in all, plus a ceremonial cape. I'm grateful to Gonzo for putting so much heart and soul into this vestige of civil society, which the public schools barely have funds to support. In a more enlightened society, we would have more of these debates on television and the Web. These cerebral sports don't get nearly the attention they deserve. Lindsey has ordered up a storm of outdoor survival products, spending literally days in the Web doing the necessary homework. She's been describing to me all these purchases and how they fit into her vision. Solar charger, lights, water filter, kelly kettles... repair kits. Her plan is to strike out in the dead of winter to test her metal as a cyclist-camper. If these early tests go well, her radius will steadily increase. If all goes per plan, we'll be seeing a lot less of her around Portland, is her latest news. At her request, I contributed an OLPC XO to her on-the-road inventory. Tara has lent her a battery-powered keyboard. More action around the Blue House tomorrow, preparing food for the homeless and then distributing sleeping bags by bicycle, a Laughing Horse project started by Lindsey last winter. Food Not Bombs is invited to join in. Lindsey has been an effective community organizer during her chapter in Portland. She will be missed, and not just by me. Thanks to cues from Nick, a current guest, I watched David Kaiser's lecture How the Hippies Saved Physics. This MIT-based history-of-science guy gives a lot of credit to Werner Erhard (and to CIA spooks) for funding a transitional (and talented) cast of characters who took physics from its Cold War phase into its more philosophical phase. I filed some pointers to Synergeo. I've been echoing the thread on Verboten Math from a Math 2.0 list. I had Noah over again today, age 12, for some Python computer language lessons. His mom joined in for part of the lesson. We like to share Youtubes and explore little known aspects of Google. Did you know about the Google version of Pacman? Noah was quite ready to code up a Python class/blueprint, a template for any number of objects. He's already studied some Java, so had some questions about public versus private variables. I showed how we do this in Python in my sample code. I recall the term "fashionista" from the Bruno DVD. Much of what motivational psychology is about is this drive for "coolness", which is of course a moving target. Sometimes a style will make a come back though. I'm reminded of the movie Being There. Our hero (played by Peter Sellers), had just the right look when his time in the limelight came around. These games around fashion may seem the apogee of self-indulgent nonsense a lot of the time. The narcissism may be intense, as the pro models learn to strut the latest stuff. One needs to not only look good, one needs to feel good about looking good, to perform in the groove, to stay in the zone. William Burroughs spoofed this as DE ("doing easy"). The flip side is feeling awkward, inept, out of one's depth, dorky. One needs to go through these "I'm not cool" experiences in some chapters, when adapting to new styles. If one's resistance level is too great, then one gets stuck in a rut, and maybe hopes the old music and dance numbers will at least have a niche. One finds one's flock, one's natural audience for a finite set of karaoke numbers, perhaps even written by one's self, in a past chapter. Here at the Blue House, we have these same growing pains. Just when I'm at the top of my game in some dimension, a superseding technology or better way of doing it comes along. Take Visual FoxPro for example: that used to be my bread and butter. 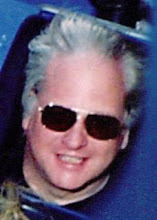 If it weren't for using Python, I'd be looking more reptilian (more like a dino -- and yes, I know they were more like birds). In terms of having the right credentials for this zip code, we're gold at the moment, maybe platinum, and yet there's a sense of imitators nipping at our heels. We're surrounded by serious urban gardeners, community organizers, radical teachers, star debaters, other IB students, other Quakers, other cool individuals who sew their own clothes and make yogurt out of soy milk, made directly from ground soy beans. Not needing electricity may be a next trick, cooking with sunlight at some tailgate party for bicyclists / tricyclists (semi-clothed) and their sensor-equipped trailers. We hold our own as fashionistas, but the competition is intense. On the activist front, criminalizing nuke weapons has never been trendier, even among so-called conservatives (sometimes just a euphemism for "among the last to catch on"). Carol was interviewed for KBOO after Countdown to Zero, like how cool is that? The show has since aired. To keep ourselves in the zone, it becomes necessary to tap into that 73% of the universe (aka the collective unconscious) known as "dork energy". This is where we talk to God (or Bob Dobbs as the case may be) about our deficiencies, our uncoolness, our sins. Confession is important, the Catholics got that right. You need to find a good ear, as just talking in your head will not necessarily do the trick. For me, the Linus Pauling House group has been a good source of feedback. We know we're dinos in some dimensions, unable to roll back every sign of obsolescence. On the other hand, as committed scholars and thinkers, we're able to stay up to speed in other respects, plus have the benefits of long and varied experience. That's not my only source of feedback though. Speaking of feedback, I was privileged to catch up with Dr. Tag recently, my Palestinian friend. She's off to Malaysia in the near future. We talked about visas, other complications of world travel. She's a fan of Yemen in much the way I'm a fan of Bhutan: people don't freak out when the electricity fails them. Not that either of us have much access to our respective ideal countries. Neither of us has much use for idle tourism, and the free open source eco-villages ala GOSCON etc. are still in storyboard phase. A still rustic, simple way of life keeps people honest and in touch with their physical environment, their integrity. There's no need to spoil this, by adding too much glitz and faux glamor, much as the media moguls might like to pimp it out more, add more crass consumerism. There's a big difference between being a consumer and a connoisseur. Yes, I'm connecting back to our theme of encouraging Havana, the whole of Cuba, to stay free of fast food franchises, and to continue nurturing a more well-rounded way of life. That would be strong PR, attractive to Global U students seeking meaningful experiences in collaborative environments, making and delivering ice cream or whatever. Driving gas guzzlers past the fast food window was cool at one time in El Norte, but is today a more reptilian activity, neither romantic nor even warm blooded. On the other hand, reptiles are cool in other contexts (like Jurassic Park), so I'm not about to fall into the trap of demonizing them across the board. Speaking as a Pythonista, that'd be somewhat counter-productive. The Cult of Athena (so-called) remains enamored of Pythons, Apollonian atrocities notwithstanding. I told Marian, Multnomah Meeting's Recording Clerk, that I thought the Food Not Bombs policy of feeding anyone who showed up was about a commitment to community and besides, what would be the alternative? A test of low "net worth"? USAers have this pathological way of talking about people as having low, no, or even negative "net worth" -- which makes sense in terms of some of the board games they're playing (like Monopoly), but then they tend play by those rules no matter what the walk of life, don't they? Like, everyone is poor in the USA, spiritually speaking, given all the inferiority conditioning that goes on. As RBF would point out, the flip side of "earning a living" is "not deserving one" by default. You've got to "prove" your right to freedom. You're born into a state of servitude. That's not what the original coders of the USA operating system intended, but then the counter-revolution has been unrelenting. Many new bugs have been introduced. I really liked this fast drawing cartoon (above), but couldn't help thinking the economists it depicts are overly mystified. Our "gnu world order" did not emerge inexplicably. On the contrary, engineers know that tool use creates life support, whereas money is merely a measure of same. Take away the skilled tool users, the Morlocks, and your Eloi money becomes worthless. The last FNB meetup featured a skills sharing about building bike trailers from bamboo. Some of these same folks took off for a skills share this weekend, put on by some of the same personnel doing the first aid trainings. FNB is also about learning how to community organize and cook healthy food for medium sized groups. I wrote another gossip column for the folks on Synergeo, using my chattier writing style. I like to switch gears a lot, like in some of this Willamette Week stuff I've seen. In the meantime, math-teach is seeming downright political in this thread about political humor -- I'm reminded of the Other Russia movement. For those readers unfamiliar: PPUG = Portland Python User's Group. If you word search on my three blogs (worldgame, controlroom, mybizmo), you'll find plenty of prior write-ups. So tonight was our last gathering at WebTrends, at the top of a Portland skyscrapter adjacent to Pioneer Courthouse Square, a prime location. Next meeting: Urban Airship, their new digs in NW. Looking forward. Wow, tonight was esoteric, about extending Python in multiple directions. Ctypes is a great module for importing a DLL or Unix/Linux so (shared object) and using it directly. I asked if this'd work with COM. Not sure. Anyway, it's cool. Did you wonder about extending Python with FORTRAN? That's a whole cult. FORTRAN has hardly gone out of style, even if the punch cards are no longer (lots of chuckles). f2py is truly awesome. Wrap your FORTRAN compiled object with C, and import it into your Python scripts. NumPy is of this genre. Then we learned about GMPY and GMPY2, the extended precision modules. Such awesome tricks. Mutable integers? Amazing. Extend precision to 1000 bits (or more), and ask about pi. There it is, to many decimals. Impressive. The most esoteric talk: extending Python with OCAML. It's that C-language bridge that eats up cycles, translating data types from this language to that. If you really wanna multiply two 100 x 100 matrices in the shortest time, consider NumPy (back to FORTRAN). Ocaml is cool though, no question. Brilliant talk. IronPython is dead they tell me, wow. Seems like Microsoft really missed the boat then. I'll have to think about that one. Good conversation with Jason, about women in computer science. I say they own it. Not the majority (male) view. Thanks again Michelle. You're a great leader and a lovely individual. 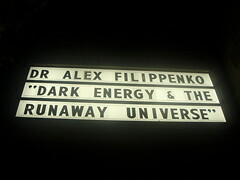 Alex Filippenko is a popular lecturer who knows how to engage a lay audience. Our Pauling Memorial Lecture series folks are more sophisticated than average, as Alex readily pointed out, so we might not have needed as many cosmetology vs. cosmology jokes, but those were the slides, a part of the script. Ironically, I was wondering if his hair was dyed (so dark), but Tara said professors weren't that vain. Or maybe they cultivate the gray look. Cosmology is still in its infancy, it's probably safe to say, as is humanity, which isn't to say humans are guaranteed a long trajectory. During Q&A, Alex expressed his opinion that humans, broadly defined, are a rarity in the universe, even if microbial life maybe isn't. Their intelligence may not confer sufficient advantages to keep them in the game. Here we are, only about 160 million years into the homo sapien experience, and we're already giddy and teetering, devoting zillions to weapons of mass suicide (WMSs). "Dark energy" is mostly a placeholder these days, as is "dark mass" (these two are not the same). Plain old Newtonian gravity isn't providing a satisfying explanation for the galactic clusters cohering, which is where dark matter comes in. Dark energy, in contrast, is repulsive (or repugnant -- more jokes), and is responsible (in a theoretical sense) for pushing the clusters apart. The bulk of the lecture was about detecting supernovae of a particular chemistry (A-1 type) and using these as "standard candles" to register distance. The work is tedious, but software helps. Monitor a few thousand galaxies a night, superimposing successive frames, and find the deltas, the bright spots. Two teams were doing this work, which was productive, both for the competition (a sport) and for corroboration once the results started coming in. These results were surprising: the receding of galaxies appears to be speeding up, starting around 5 billion years ago. Before that, the expansion was slowing, or so measurements seem to show. Dr. Filippenko has his visuals. He threw a bright red fake apple into the air numerous times, to illustrate points about gravity, expansion, contraction, Einstein's cosmological constant. The rubber band with the balls strewn along it simulated an expanding universe. He also had a small blue balloon to inflate. Much of the banter was "by the book", is what you will find in introductory textbooks on cosmology. The very meaning of "the universe" seems to have broken down, now that we have talk of multiple universes, with some philosophers proposing communications between them. Partially overlapping universe scenarios might suggest eternal regenerativity to some minds. Each universe would be another way the game could be played, a set of realized possibilities. Such talk is purely speculative of course. Alex asserted his credentials as an experimentalist, not a theoretician. Tara joined me for this outing, an expanding universe in her own right, an active thinker eager to learn from her world. I so wish for a better civilization for her and her peers. My own universe seems to have settled into a combination of sorrow and love. I'm deeply fond of these people, awed by the suffering. Thinking of Paul Tillich and his "courage to be". Good seeing Juliet and Jerome in the auditorium. Jerome went to middle school with Alex. Juliet was my contemporary at the International School in the Philippines.